the encompassing gift of the cross, Jesus paid it all! 1. Under "Review Sheet Music" click the CHORAL ARRANGEMENT link. Print the PDF file, then click the "return" arrow on your web browser. 2. With music in hand, under "Listen" click the CHORAL ARRANGEMENT link. & Cover art. Print on 8 1/2 x 11 paper. If purchase is required, after purchase you will receive an email from eMUSIC FOR WORSHIP that includes files of your purchased eMusic product. There will NOT be a download link on your final purchase page. 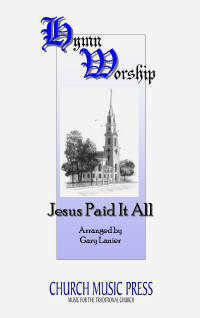 You will receive a SEPARATE email from eMUSIC FOR WORSHIP with your downloadable purchased products. Some products are purchased through PayPal. CALL: 580.584.2889. Give your name, business, shipping & billing address, and the music order, including Quantity, Title, Catalogue #, and Price. (c) 2010-2011 by The Lanier Company. All rights reserved.